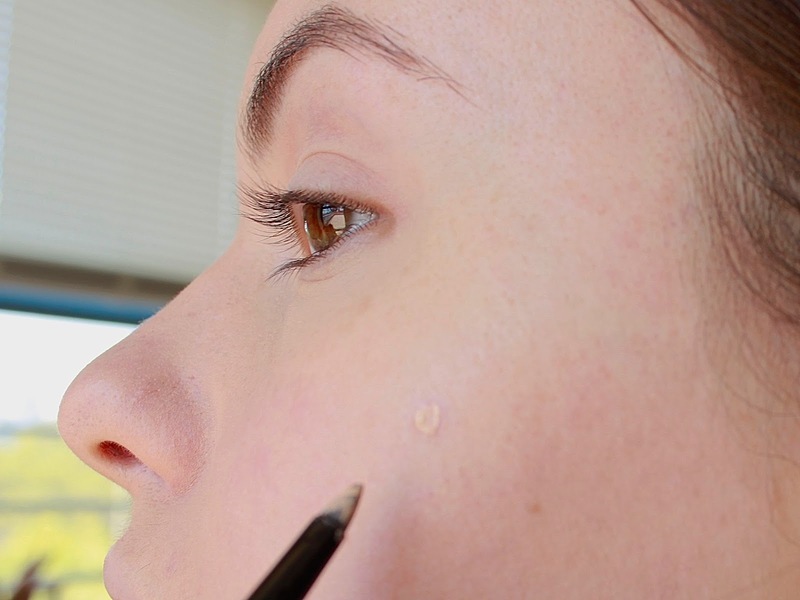 Finding the right shade and formulation for you skin can take years. I'm still constantly tweaking my routine, and I don't expect to stop anytime soon. After all, your skin is a living, breathing organ that's constantly fluctuating. Your skin's issues (or lack thereof) can change due to a number of factors, from stress to hormones to environmental pollutants to the type of water that comes out of your faucet; I often notice my skin looking better or worse when on vacation and using the same products due to the weather or water quality. All that aside, most people do have a specific skin type and it's good to spend some time figuring yours out. I have combination skin that gets dehydrated pretty easily, so I always moisturize twice a day, exfoliate every other day and try to drink plenty of water. Choosing the right shade can be maddening. For this reason, I generally prefer to buy foundation & concealer at a department store, Sephora or MAC so I can try on the shade; these are the only types of makeup whose shades are truly unique from person to person. Buying at a drugstore is a crapshoot; I got lucky with the Revlon foundation below, but generally what you see in the bottle isn't necessarily the way the makeup will dry to on your skin. When you go shopping for foundation, pick out a few shades that seem close to your skintone. Swatch a few on your jawline, starting just below and extending to your cheek. Then, walk outside and see how they look in natural light. That type of light is the best indicator of whether you've hit it or not. Pay attention not only to how light or dark the shade is, but how much yellow or pink it has compared to your skin. I know that my skin is very cool and pink-toned, so I never go near anything too yellow-looking. 1.) When I wake up, I splash my face with water, apply moisturizer & sunscreen and allow them to sink in for 15 minutes or so before beginning the next steps. 2.) I've been changing up this first step lately, but at the moment I begin by applying a green-tinted primer to counteract the general redness I get around my nose, chin and cheeks. I've been liking this one from NYX; the lavender-toned primer is good if you tend to have yellow or sallowness in your complexion. If not for the green tone of this primer, I would skip primer altogether and instead apply a thin, fine powder like Tarte's Amazonian Clay Finishing Powder, which helps to lock in the moisturizer below the foundation. Primers are loaded with silicone, so they can make your foundation feel very heavy very quickly. It really depends on your preference, and how natural you like your makeup to feel. Lately I've been playing around with using nothing between moisturizer and foundation; with a longwear foundation, that's usually just fine! 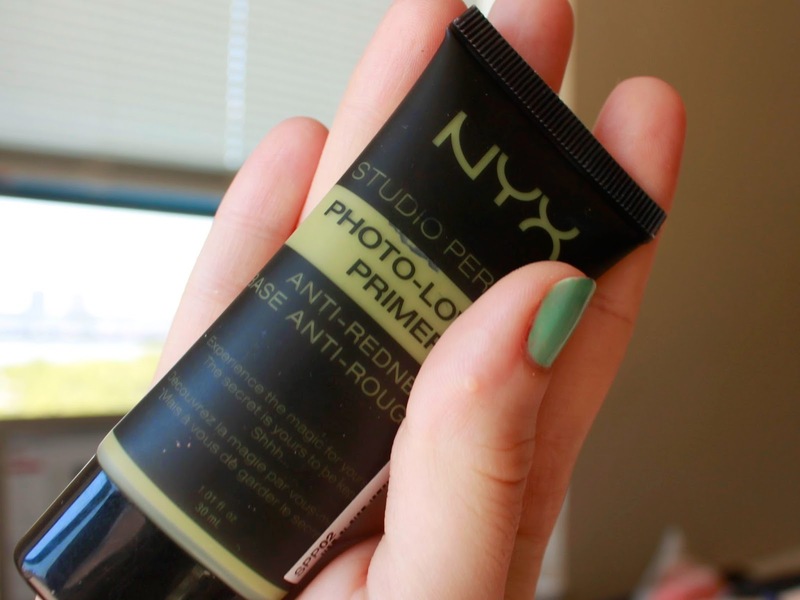 If you do choose a primer, take note of whether it's silicone or water-based. Generally, if it has anything ending in "-cone" or "-xane"is near the top of the ingredients list, it's silicone-based. You want to pair silicone-based primers with silicone-based foundations, and water-based primers with water-based foundations. If not, the two will separate over the course of the day and look patchy. 3.) 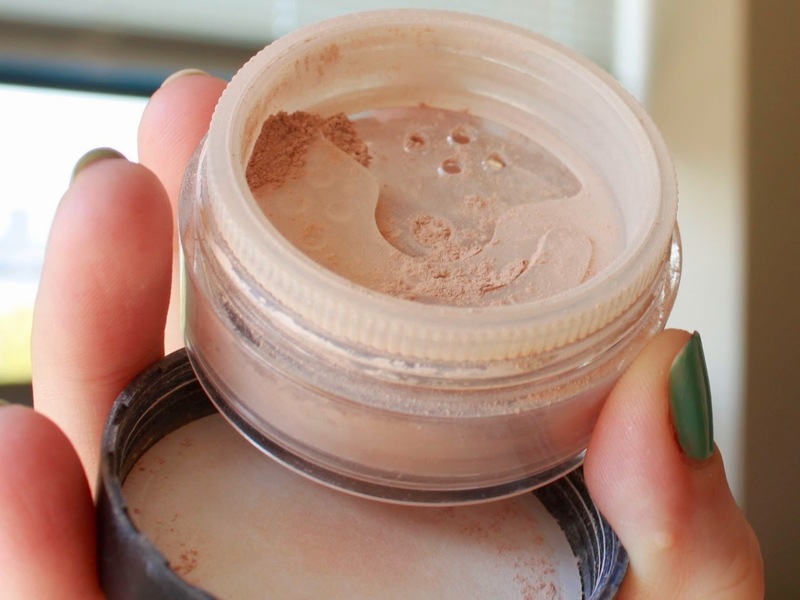 This is the step I only do for special occasions: a loose-powder mineral foundation. I like bareMinerals Original Foundation a lot; I often use just this as a foundation in the winter. I apply this to areas where I have a lot of redness leftover or where I have particularly bad acne to subdue that redness even more. This allows me to use much less concealer in the next step, which can be somewhat tedious if you have a lot of blemishes or old acnes spots like me. To clarify, I know it sounds like overkill to use two foundations. Over time I've come to accept some of the redness in my face as just part of me and don't feel the need to cover every spot of it every day. But, from time to time, it's nice to have a totally even-toned complexion if I'm doing dramatic makeup elsewhere on my face or if I'm going to a special event. 4.) Next, it's time for regular foundation. Since it's been so sticky in New York this summer, I've been using this Revlon Colorstay Foundation in Ivory 110. I find that this can highlight dry patches in my skin, but generally I've been happy with its staying power. I apply this with the same foundation brush used for the mineral powder. When the weather gets cooler I'll probably swap out this step for a BB Cream for added moisture and sheerer coverage. 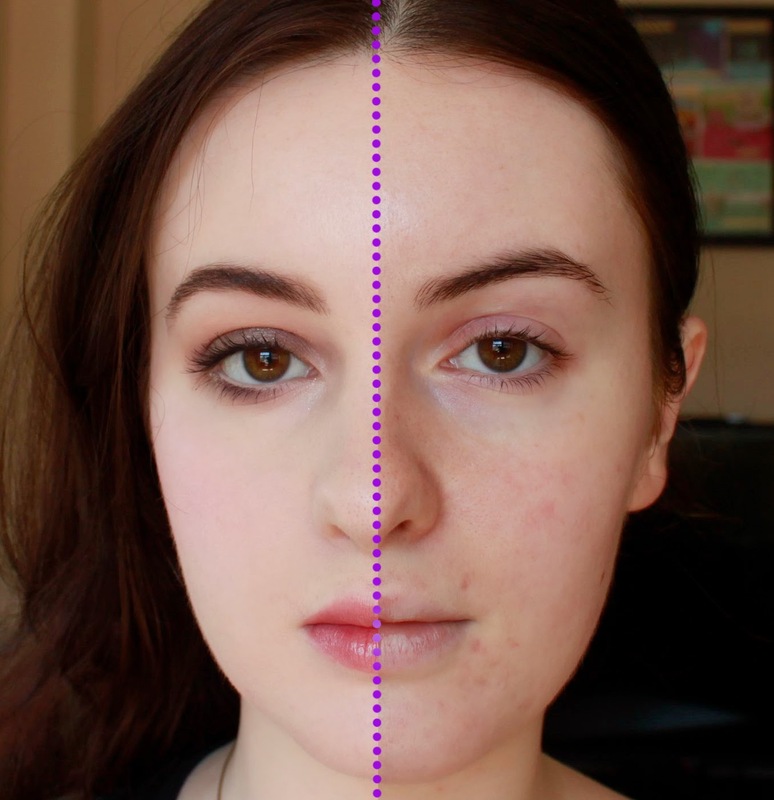 I find that a good long-wearing foundation is really important for me in the summer not only because I'm sweating more, but also because the heat makes my skin even redder so the extra coverage is important. 5.) Concealer time! A few months ago, knowing that the humidity of summer was coming to wash away all my cosmetic efforts, I splurged on MAC's Longwear Concealer, and it was totally worth it. This stuff stays put! For my eyes, I like to start by using Urban Decay's Primer Potion all over my lid and crease (for any eye makeup to come) and a bit under my eyes. 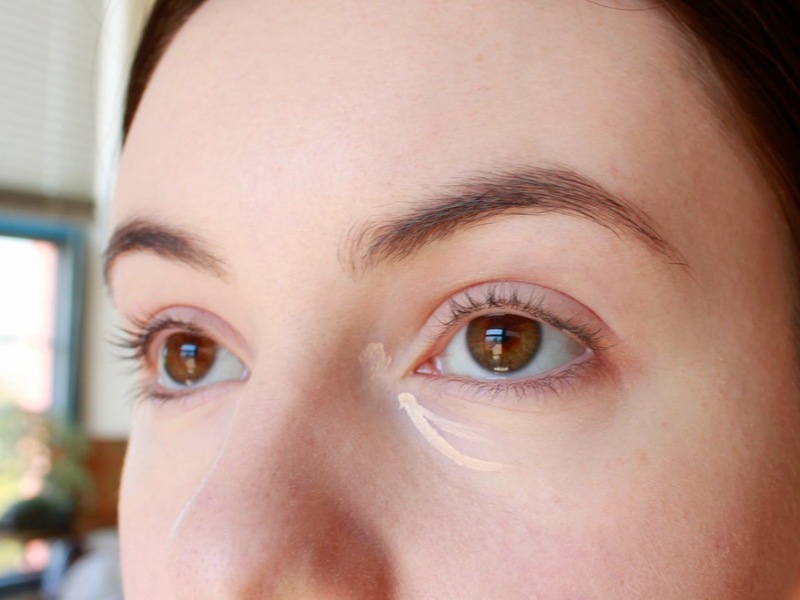 Some people will use a concealer under their entire eye, but I find it more effective to use it just where I have some blue tones, which, as you can see in the picture to the left, means in a quarter-circle underneath and a bit just to the side of my tear duct. I apply that with a small brush (see below) and pat it in with my finger. You can also use a Q-tip to apply. I do find that using a tool like that for the initial application makes the concealing much more precise than just using fingers. I upped the contrast of this photo so you can see me covering a blemish. This handy little brush came with Maybelline gel liner I bought. 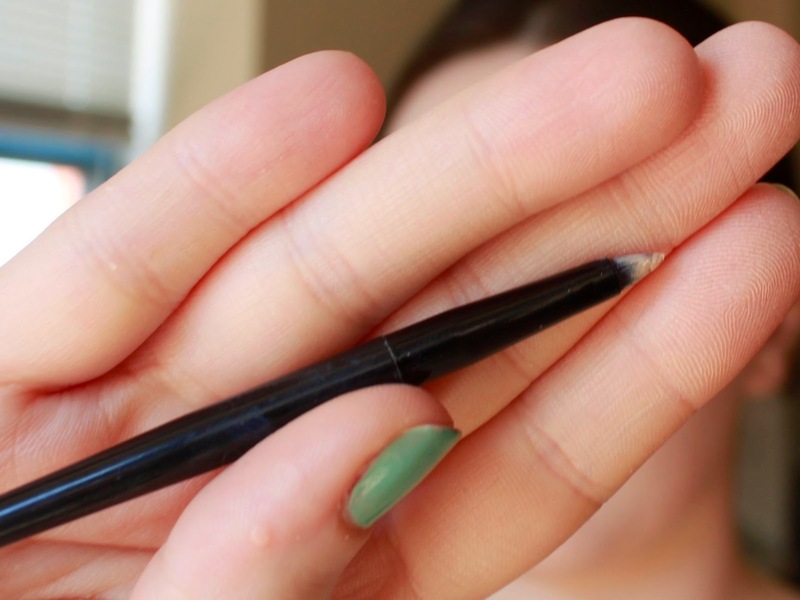 It's too big for applying eyeliner for me, but I kept it and it's fantastic for applying concealer. I apply the product directly where I need it and pat in with my finger. As you can see in the title image, I have a good deal of acne scarring around my chin, and I just go part by part concealing any spot that shows through the powder. That about does it for the foundation and concealer portion of this makeup! Let me know if you'd like a more in-depth summary of the smokey taupe eye makeup I ended up with in the title image; as a quick overview of the rest of the face, I used MAC's Casual Color in For Your Amusement on my cheeks, Urban Decay 24/7 Glide-On Shadow Pencil in Mushroom on my lids and L'Oréal Colour Caresse Wet Shine Stain in Endless Red for lips. Thanks so much for reading, and please comment with any foundation/concealer questions you have!